PRE-HOLIDAY SUPER SALE: Save 5% today when you buy 2 or more TAG Camping Hammocks. Enter code BEH8D2Y5 at checkout. Even BIGGER discounts in the "Special Offers" section below. Makes a GREAT holiday gift for everyone who loves camping! EASY TO USE! Our backpacking hammock has rope and heavy duty steel carabiners which means that you can setup the 2 person hammock up in minutes, even if you're not skilled with rigging and knotting. You can be horizontal and snoring (not you, never!) just minutes after you reach your campsite. You'll be the most stress-free and rested person on your trip! UNIQUE! Unlike other hammocks for camping which don't have reinforced stitching, our product features high grade triple interlocked stitches. That means you have support and don't have to worry about you, or your spouse or child, ending up on the ground. That's why people love our two person hammock! REMARKABLE RESULTS! Why do Amazon Customers LOVE our hiking hammock? It's simple. 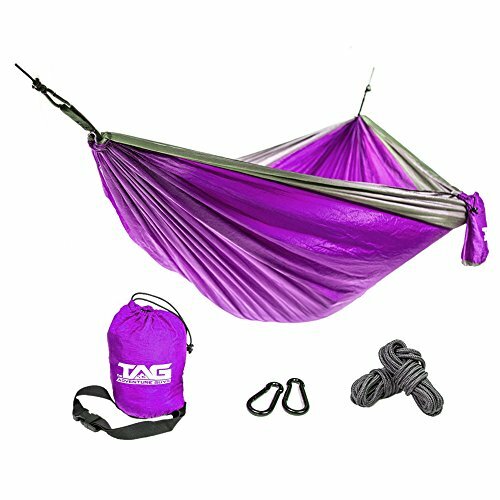 Our outdoor hammock, as well as the attached carry bag, are made of 210T parachute nylon fabric. That means you'll be as safe as a skydiver (they use the same material!). So it's tough, but also super soft and comfy and with the carry bag attached, you don't have to worry about losing anything! 100% GUARANTEED! Your portable parachute hammock comes with our exclusive The Adventure Guys LIFETIME "You'll LOVE it or we'll eat it" guarantee. That means you either love your travel hammock, or you get 100% of your money back. No. Questions. Asked. ANSWER: ABSOLUTELY! Our hammock is lightweight (2.2lbs.) and the carry bag makes it super easy to carry. That means that you will have a comfy place to chill everywhere you go without having to throw your back out to get it! ANSWER: YOU KNOW IT! We built our hammock with a pouch that has more than enough room to hold the rolled up hammock, ropes (or straps), carabiners AND your phone and beer when you’re in it. You don’t have to worry about losing any of the parts (especially the bag!). QUESTION: Does your hammock come with instructions? ANSWER: You bet it does! Inside the box are detailed instructions including a “how to” video that will get you up to speed using your new hammock in minutes! ANSWER: FOR SURE! The problem with other hammocks is they have to be replaced way too soon. Our product solves that problem! Why? Our product is built from parachute nylon. That means that it is durable, breathable and mildew resistant. Never suffer from a poorly made, heavy and smelly hammock again! ANSWER: 100% it does! You risk absolutely nothing. Our hammock is backed by an unconditional “You’ll LOVE it or We’ll Eat It” guarantee. If you don’t love it, you can have your money back!